David Frost’s 1976 interviews with former President Richard Nixon were carried on the British Broadcast Corporation’s station (BBC) in May of that year. 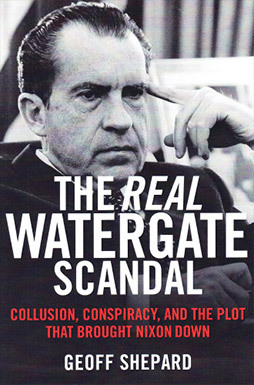 A DVD of the Watergate portion of those interviews is available for sale at the Nixon Library in Yorba Linda, California. Over thirty years later, renowned playwright Peter Morgan (who also authored The Queen in 2008), authored a London stage play about those interviews. The play eventually came to Broadway, but the movie rights were soon purchased by Ron Howard, who postponed further productions of the play until the movie had been released in December of 2009. While most entertaining, Shepard was deeply troubled by the factual alterations and poetic license which differed markedly from what had actually transpired. These are the essays he authored on each—since the movie took even more liberties with the truth than did the play itself.